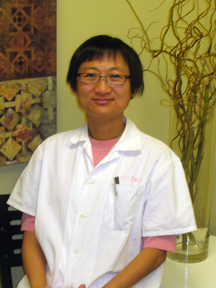 Dr. Limin Lo received her Traditional Chinese Medicine (TCM) degree in China in 1987. After graduating from Shanghai University of Traditional Chinese Medicine, she worked as a physician in one of the university hospital for 5 years. She obtained her acupuncture license in 1996 and practiced acupuncture, acupressure and Traditional Chinese Medicine in Alberta since then. She has worked as examiner for the provincial acupuncture registration exam for 10 years.